Mad Norwegian Press, 9781935234043, 192pp. 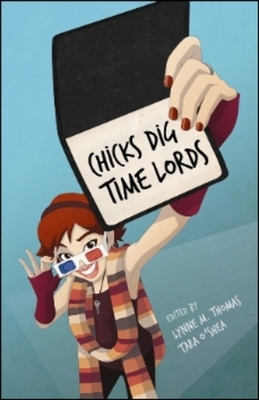 In Chicks Digs Time Lords, a host of award-winning female novelists, academics and actresses come together to celebrate the phenomenon that is Doctor Who, discuss their inventive involvement with the show's fandom and examine why they adore the series. These essays will delight male and female readers alike by delving into the extraordinary aspects of being a female Doctor Who enthusiast. Essays include Carole Barrowman discussing what it was like to grow up with her brother John (including the fact that he's still afraid of shop-window dummies), columnist Jackie Jenkins providing a Bridget Jones' Diary-style memoir of working on Doctor Who Magazine, novelist Lloyd Rose analyzing Rose's changes between the ninth and tenth Doctors and much more. Other contributors include Elizabeth Bear (Jenny Casey), Lisa Bowerman (Bernice Summerfield), Mary Robinette Kowal (Shades of Milk and Honey), Jody Lynn Nye (Mythology series), Kate Orman (Seeing I), and Catherynne M. Valente (The Orphan's Tales). Also featured is a comic from the Torchwood Babiez creators, plus interviews with Doctor Who companions India Fisher (Charley) and Sophie Aldred (Ace). Contributors include: Gail Simone, Carla speed McNeil, Colleen Doran, Jill Thompson, Jen Van Meter, Seanan McGuire, Marjorie Jiu, Sara Ryan, Delia Sherman, Sarah Monette, Elizabeth Bear and Mark Waid.